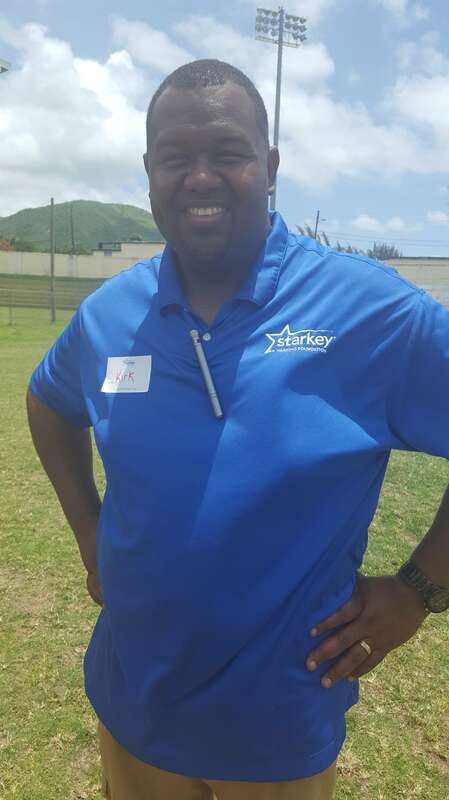 BASSETERRE, St.Kitts-Scores of residents, on Wednesday 7th June, attended a free hearing aid clinic organised by the US-based Starkey Hearing Foundation which was hosted at the Warner Park football grounds during the group’s two-day outreach in St.Kitts-Nevis. Apart from the free check-ups, the Foundation has donated hearing aids, ear molds and batteries to patients. The International Development Director for the Caribbean, Kirk Richards, explained that working through the Ministry of Health, patients that are in need of hearing aids that require such services were identified. He had informed that the visiting team comprised of individuals from all over the Caribbean and US to assist in providing hearing aids to those in need. At the time if the interview, over 50 patients were registered. Richards said a lot of them were seniors whilst noting that there were at least two or three children around the age of eight. Richards talked about an after care follow-up programme that has been put in place. According to him, the foundation is working with the Ministry of Health and nurses in different areas who will to do follow-up with the patients on a monthly basis by calling them or having them go into the clinics to get check-ups. “So that’s one of the beauty of the partnership that we’ve built with the Ministry of Health,” he said. Special mention was made of the Rotary Club of St.Kitts Club which has been instrumental in helping to organise the event as well. Richards disclosed that the Starkey Hearing Foundation has been around since 1984 providing the gift of hearing across the world.